Dogs and people working together. Saving neglected, abandoned canines nationwide with no time-limit sheltering, urgent vet care & adopting them out. 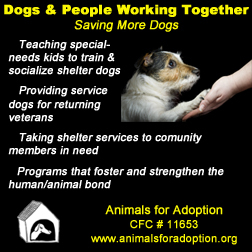 We teach at-risk children to train shelter dogs so both flourish, and have a prison dog training program. Our pioneering new project benefits both our shelter dogs and special-needs children. Partnering with Green Chimneys, a U.S. leader in special education, our dogs calm the children, helping them learn. The kids help train the dogs, making them more adoptable - -a true Win-Win. Here's how it works: Our dogs go to Green Chimneys for 6 weeks, visiting classes, dorms and social work sessions. Our trainers show the kids how to teach dogs obedience and other skills. The dogs give the kids complete acceptance and the kids respond with kindness. The kids and dogs blossom. Jerry is a recent program "K9 graduate". He was abandoned and arrived at our shelter loosing hair and constantly scratching. Still, he was incredibly friendly with people. After many skin scrapings, we uncovered Jerry's allergies. ?He was given medication and a special diet. ?But he arrived at Green Chimneys completely unsettled. He chased every leaf on the ground and had no manners. After 6 weeks of student training and socialization Jerry learned his commands and how to settle down, critical traits for gaining a forever home. Jerry's courage, sociability and eagerness to learn appealed to the head of a group providing service dogs to veterans. Jerry is now training as a service dog for a returning vet, where he is doing great. needs kids nationwide. With your help it will continue to grow.